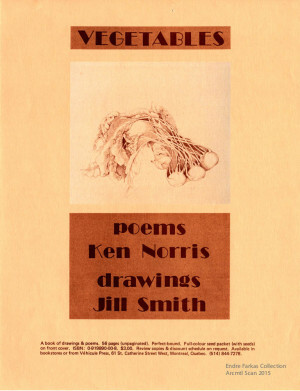 Ken Norris was one of the “Véhicule Poets”, an informal bunch of poets who hosted and participated in readings at the Véhicule Art gallery and performance space on Ste. Catherine St. in the early to mid 1970s. He has more than two dozen publications of poetry to his credit and has had work appear in countless anthologies. Born in New York, he now teaches creative writing and Canlit at the University of Maine. Louis Rastelli corresponded with him for the following interview about the Véhicule Poets era in Montreal. KN: Everyone finds their own unique entrance into this realm. My path was kind of carved out for me by a visual artist named Jill Smith. She and I had been working on this collaborative project together. She was doing drawings of vegetables, and then I was writing poems in response to her drawings. 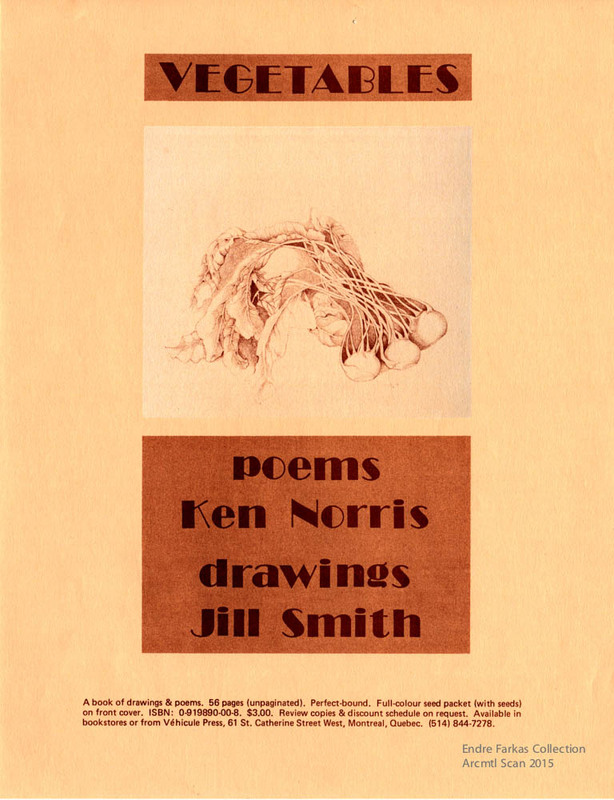 Folks who have seen the book that resulted, Vegetables, which was my first book, probably figure that I wrote the poems and then Jill did the drawings, but in point of fact the drawings came first. She did the drawings and then I wrote the poems. Anyway, we’d been working on this project for maybe a couple of years when she decided to take it down to Vehicule Press, which was in its early days, sometime towards the end of 1974. And they liked the project and decided that they would like to publish it in book form. I got a phone call from Jill telling me that our book had a publisher when I didn’t even know we had a book or that we were looking for a publisher. So having my first book in the works at Vehicule Press was what brought me into the orbit of the Montreal small press scene. I must have popped in at the press in early 1975, and couldn’t help but notice that they were located in the back of an art gallery called Vehicule Art. And someone, Simon Dardick probably, mentioned to me that there were poetry readings at the gallery every Sunday at 2 p.m. So I started showing up for readings in January, and by March the book was in press, and by the end of March it was in stores like Classics, The Double Hook and The Word. By the middle of April it had been reviewed in The Montreal Gazette and I was doing interviews on the CBC. At the gallery I met printers, and artists, and poets. By the end of 1975 I was on the editorial board of Vehicule Press,; by the end of 1977 I was a member of the Board of Directors of Vehicule Art; and by early 1979 I was in an anthology of seven poet s called The Vehicule Poets. With a friend of mine in New York, Jim Mele, I was also running a little magazine, CrossCountry, and a small press, CrossCountry Press. In September 1975 I started working on a Ph.D. at McGill, and the professor I was most interested in working with was Louis Dudek. For the next five years I quizzed him about all of the small press activity he had every been involved in (Contact Press, Delta, McGill Poetry Series, CIV/n, DC Books) and tried to apply some of that forties and fifties small press methodology to what we were doing in then contemporary Montreal. LR: That is interesting. I would have loved to have the opportunity to work with Mr. Dudek, a living legend at the time! KN: He was a living legend, but he was also a Professor at McGill. The first time I went to see him were during his office hours. I introduced myself to him as a student newly arrived in the Ph.D. program at McGill and gave him a copy of my first book, Vegetables. 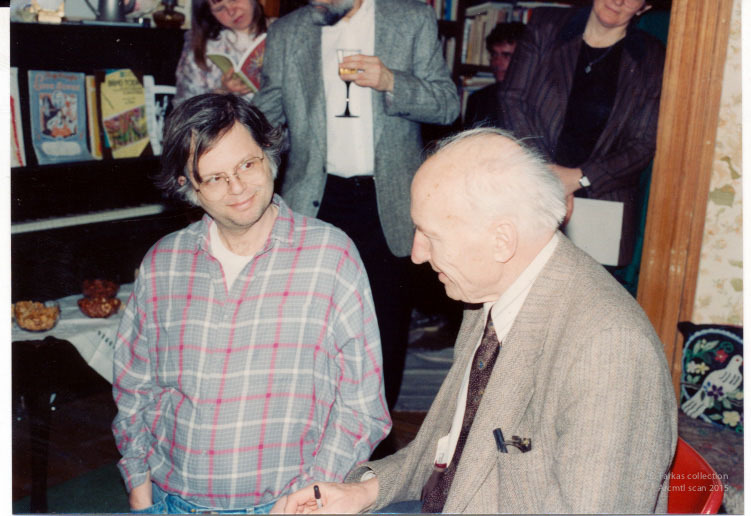 I had spent part of that summer reading his long poem Atlantis, and also looking into that book that he had edited with Michael Gnarowski, The Making of Modern Poetry in Canada.. I was learning a lot about Canadian literature on a daily basis, and when the Graduate Director of the English Department asked me what course I might be interested in being assigned to as a teaching assistant I said “Canadian Literature.” Even though I didn’t know very much about Can Lit at that time. I figured that teaching it would be a very quick way of learning about it. But I was already starting to pursue my study of Canadian literature with what could be described as a missionary zeal. And who better to learn from than Louis Dudek? But he wasn’t teaching the Introduction to Canadian Literature course—Marianne Stenbaek was. So I audited one of Dudek’s graduate courses in Modernism, giving myself a reason to show up in his office on a regular basis to ask him quiz questions about everything from Contact Press to who Irving Layton’s favourite poet was back in the 1940s. Answer: D.H. Lawrence. LR: I know you were originally from New York and moved here in the early 1970s. What motivated your decision to live here? KN: I was accepted into the M.A. program in English at Sir George Williams University and was offered a tuition waiver and a research assistantship. By the time I graduated Sir George had merged with Loyola to become Concordia University. I didn’t study ANY Canadian literature as an M.A. student. I was still very committed to American literature and wrote my Master’s thesis on F. Scott Fitzgerald. I started getting interested in Canadian literature a couple of years later when I found myself on the road to becoming a Canadian author, or an author who was being published in Canada. But, you see, by 1975, the Modernist period in American literature was over, and all of the Modernist authors had passed over to the other side. In Canada, because Modernism had started in Canada maybe 15 years later than it had in England and America, many of the Modernist writers were still alive. F.R. Scott was still alive, and I went over to his house for tea. A.J.M. Smith was still alive, and I went to hear him do a poetry reading at the Cote St. Luc Library. I corresponded with Earle Birney and edited a selection of his essays for Vehicule Press. I met Dorothy Livesay and she invited me to be the Quebec representative of CVII. In later years, Simon Dardick, Peter Van Toorn and I tried, unsuccessfully, to get Leo Kennedy to do his second book of poetry. To be able to have actual conversations with the Modernist poets of Canada was something that really wowed me. It moved me more in the direction of being a Canadian poet. Because an American poet couldn’t talk to Ezra Pound or H.D. or William Carlos Williams or T.S. Eliot—they were all deceased. The Canadian Modernists were still among us. And I could also talk to Louis Dudek, and have dinner with Irving Layton, and send Raymond Souster the occasional fan letter or a request for poems for my little magazine. My feeling about Canadian literature was that it was ALL HAPPENING NOW. Whereas American literature had had its Golden Age and had moved along to something else.